At nightfall and early evening, people at mid-northern latitudes see the famous Belt of Orion – three stars in a short, straight row – about halfway between the southern horizon and straight overhead. 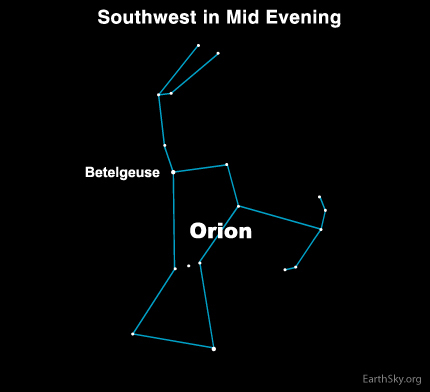 Later at night, you will find Orion in the southwest. Above Orion’s Belt, you will find one of the sky’s most famous stars, ruddy-hued Betelgeuse. Kids especially like Betelgeuse, because its name sounds so much like “beetle juice.” The movie by that same name perpetuated this pronunciation. However, astronomers pronounce it differently. We say BET-el-jews. People have described this star as “somber” or sometimes “grandfatherly.” That may be because of Betelgeuse’s ruddy complexion, which indicates that this star is well into the autumn of its years. However, Betelgeuse is no ordinary red star. 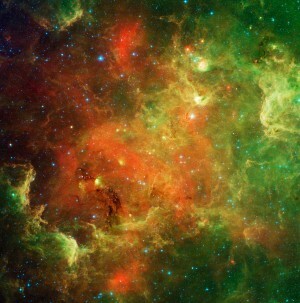 It is a magnificently rare red supergiant. According to Professor Jim Kaler – whose Stars website you should check out – there might be only one red supergiant star like Betelgeuse for every million or so stars in our Milky Way galaxy. By the way, at this time of year, Betelgeuse’s constellation – Orion the Hunter – ascends to its highest point in the heavens in the evening, with the Hunter symbolically reaching the height of his powers. As night passes – with Earth turning eastward under the stars – Orion has his inevitable “fall,” shifting lower into the southwestern sky by late evening. Orion slowly heads westward throughout the evening hours and plunges beneath your western horizon in the wee hours after midnight. Orion has another very bright star, called Rigel. As seen from northerly latitudes, blue-white Rigel sits below Orion’s Belt, while ruddy Betelgeuse stands above it. Site contents copyright © 2019 Recorder Online	except as noted. All rights reserved. | 83 queries in 1.215 seconds.